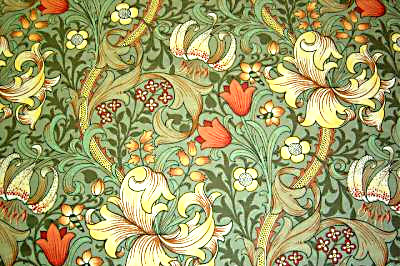 The arts and crafts movement was an English aesthetic and social movement in the second half of the 19th century. John Ruskin was a major theoretician of the movement and William Morris put the ideas into practice. The arts and crafts movement reacted against the poor quality of manufactured goods, the social organisation of production and the nature of work in the machine age. A ‘hand made’ industry was recreated along the lines of medieval craft guilds. The movement produced some fine works and became an important contributor to the art nouveau style at the end of the century. It can also be seen as a precursor of the Bauhaus in Germany and the Weiner Werkstatte in Austria. The movement was rather idealistic and not a little utopian but it has a notable legacy in the twentieth century arts centres. The Arts and Crafts Movement was one of the most influential, profound and far-reaching design movements of modern times. It began in Britain around 1880 and quickly spread across America and Europe before emerging finally as the Mingei (Folk Crafts) movement in Japan. It was a movement born of ideals. It grew out of a concern for the effects of industrialisation: on design, on traditional skills and on the lives of ordinary people. In response, it established a new set of principles for living and working. It advocated the reform of art at every level and across a broad social spectrum, and it turned the home into a work of art. The Movement took its name from the Arts and Crafts Exhibition Society, founded in 1887, but it encompassed a very wide range of like-minded societies, workshops and manufacturers. Other countries adapted Arts and Crafts philosophies according to their own needs. While the work may be visually very different, it is united by the ideals that lie behind it. This was a movement unlike any that had gone before. Its pioneering spirit of reform, and the value it placed on the quality of materials and design, as well as life, shaped the world we live in today. 'Victoria and Albert Museum, 2016, The Arts & Crafts Movement', available at http://www.vam.ac.uk/content/articles/t/the-arts-and-crafts-movement/, accessed 12 December 2016.